Global Alpha Hydroxy Acid Market size was worth over USD 1.5 billion in 2016 and will surpass 800 kilo tons by 2024. 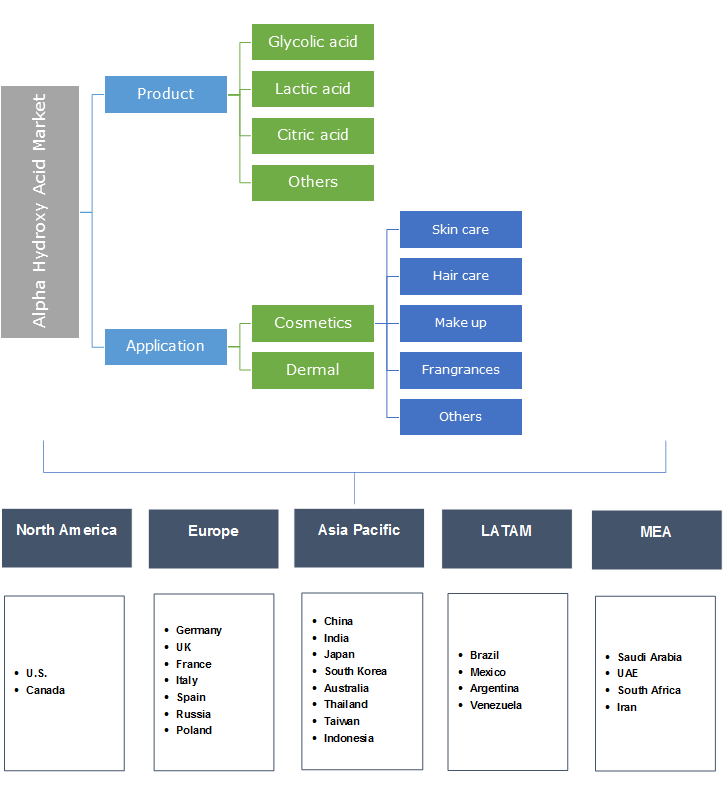 Growth in global cosmetic industry remains the key driver for alpha hydroxy acid market growth, owing to increasing AHA usage in skin care products. As per analysis, global cosmetic industry was valued over USD 290 billion in 2016 and is projected to reach USD 344.4 billion by 2021. Strong outlook in skin care, hair care, makeup and fragrance applications has enhanced the product demand. Improved standard of living along with increasing consciousness about looks particularly among women will propel alpha hydroxy acid market size. Prevention from early ageing signs, increased elastin & collagen production and improved blood circulation are the key factors driving industry demand. Global antiaging product industry will witness over 5% growth up to 2024. Rising pollution levels along with unhealthy food habits, leading to increasing skin issues will provide positive outlook for alpha hydroxy acid market growth. Moreover, rise in global warming effects has enhanced the demand for sun care products. Technological advancement in cosmetic products coupled with improved exfoliative, corrosive and toxic actions have enhanced alpha hydroxy acid market. Increasing dermatologic usage with higher AHA concentration particularly for peeling has stimulated the industry growth. Higher concentration gels and creams for peeling are carried out by professional dermatologists. Increased absorption of active ingredients from skincare creams & serums will support industry growth. Wrinkle & oil control, acne treatment, dead skin removal, black spot reduction and restoration of original skin tone are key properties encouraging product penetration. Enhanced hair nourishment, conditioning and hair fall reduction are the supporting factors for alpha hydroxy acid market growth. Additionally, improved hair strands & strength accompanied by removal of air pollutants have enhanced product scope in hair care applications. However, increased skin sensitivity due to higher product usage is the major restraint for industry growth. Rising awareness about side effects including skin irritation, redness and burning may hamper the alpha hydroxy acid market share. Glycolic acid was valued over USD 350 million in 2016. Rising demand from skin care applications, due to its benefits including uniform exfoliation of skin, dissolution of dead skin cells, blocked pores & blackhead removal and minimized pores appearance. Improved restoration of hair strength and elasticity will drive the product demand. Easy and abundant product availability from fruit extracts including pineapple, grapes and beets will support business growth. Lactic acid is estimated to register over 500 kilo tons by 2024. Improved effectiveness in skin softening and skin lightening are the key factors fuelling product demand. Moreover, improved collagen & antibacterial agent production coupled with restoration from sun damage will enhance product penetration. Citric alpha hydroxy acid will witness CAGR over 5% up to 2024. High pH balancing function has enhanced the preference for citric products among manufacturers. Comprehensive product usage in conjunction with other ingredients to brighten & rejuvenate skin will create lucrative opportunities for industry growth. Cosmetics application will witness gains exceeding 12% up to 2024. Increasing cosmetic spending particularly in developed nations due to changing lifestyle will support industry growth. Inclination towards organic and natural based products will further drive product demand. Significant product properties including reduction of aging signs, wrinkles, acne scars and cleansing will propel the industry demand. Alpha hydroxy acid also increases skin thickness and synthesis of mucopoly saccharides. Hair care application accounted for over 13.5% of overall alpha hydroxy acid market share in 2016. Prevention of hair fall by creating lubricity, allowing easier detangling and protecting hair against styling tools is expected to propel industry growth. Efficient dirt and pollutant cleaning without harming the moisture content is the key factor driving product demand particularly in shampoos. Skin care application was valued more than USD 400 million in 2016. High application scope in skin moisturizing, dead skin removal, acne treatment, improving appearance of acne scars and skin firming & smoothing will drive the demand. Increasing product usage in dry skin disease treatments including xerosis marked by dry, scaly & dark skin and pregnancy scars. APAC alpha hydroxy acid market is anticipated to reach USD 900 million by 2024. Favourable socio-economic conditions predominantly in Japan, India and China has enhanced industry demand. Increasing consumer consciousness pertaining to personal appearance maintenance coupled with changing income trends are major factors supporting the regional demand. Asia Pacific cosmetics industry was valued around USD 100 billion in 2016, and is anticipated reach USD 126 billion by 2020. North America will witness around 12% CAGR up to 2024. Shifting preference for organic, vegan and natural beauty products to reduce harmful effects of dust, sunlight and pollution will drive the industry demand. Increasing research & development spending along with product innovation by several firms will support product penetration. Europe accounted for more than 25% of total industry share in 2016. Presence of major cosmetic manufacturers including L'Oréal Paris, Garnier, Nivea and Unilever has enhanced the industry share. Increased customer spending on beauty & cosmetic products will provide new avenues for business growth. Global industry share is moderately fragmented with presence of numerous local and multinational companies. Crosschem, Dupont, Mehul Dye Chem Industries, Ava Chemicals, Dow, Parchem, H Plus Limited and Airedale Chemical Company are major industry players. Potential customers of the industry include L'Oréal Paris, Gillette, Nivea, Clinique, Chanel, Garnier and Nieutrogena. New product launches, joint ventures, acquisitions, and production capacity expansion are major strategies observed among industry players. For instance, KOSE, a Tokyo-based cosmetic company launched new skin care brand named, Spawake in India in 2015. Alpha hydroxy acid is a carboxylic compound which is available as glycolic, lactic, citric and malic. Sugar cane, lemon, grapes, sour milk, tomato and yogurt are rich sources of AHA. The product is easily moistures skin, with its high absorbability. Hence, it is used in skin care products including peels, face pack, anti-aging creams, lotions and face creams. Extensive research & development undergoing in several countries to improve product benefits will drive demand. Growth in supply chain dynamics along with advancing technologies for product engineering will positively impact industry demand.